The team at Burgess Yachts have been doing a little bragging but possibly they have every right to do so. Sixteen years ago, superyacht brokerage firm formed its New Construction division as Burgess Technical Services to project manage the build of superyachts over 40 metres on behalf of owners. With a qualified in-house team of over 20 experts comprised of technical project managers, naval architects, marine and electrical engineers, they have since supervised new build projects in 23 shipyards across three continents for a total value of approximately US$ 5.5 billion. That is well worth bragging about! The division holds the record of having been involved in more new builds between 40m and 180m than any other specialist. Burgess New Construction was also responsible for the specification and contracting of the Lürssen built Topaz. More recent projects include Azzam, delivered in 2013 which, they claim, is the world’s largest and fastest superyacht built by Lürssen. I am not sure they are correct in that boast given that Lürssen also built Shergar which, under my command, frequently exceeded speeds of 47 knots while Azzam has a declared speed of just 30 knots. Burgess New Construction was however appointed as owner’s technical consultant and project manager on Azzam to develop the brief and commission the build which involved the technical specification and contractual negotiations, project management, providing on-site supervision, partaking in tank testing, plan approval and all main machinery testing, while also advising and interfacing with both exterior and interior designers throughout this technically complex project. Another milestone project for the division was Dilbar. This multi-award winning yacht was delivered in 2016 and classified as the world’s largest yacht by gross tonnage. Built by Lürssen, with exterior design by Espen Øino and interior design by Winch Design, Dilbar is the second Lürssen new build project over 100m that Burgess New Construction has managed for the same owner. Last year also saw the successful delivery of Albatross from Delta in the USA and Joy from Feadship, Royal Van Lent. 2017 will saw the successful delivery of the CRN built Cloud 9, with a Winch Design interior for a repeat new build client. Burgess New Construction was appointed owner’s representative for the project and played a key role from the early stages, beginning with developing and agreeing the technical specification and technical aspects of the contract, and extending through the build to responsibility for technical review, inspection and acceptance, project management, on-site supervision and coordination of consultants (paint, interior installation, AVIT). The 42m Benetti Willow, was sold by Burgess during build last year and was also delivered to her owner last month. Delivery of Jubilee, the largest yacht built to date in the Netherlands is imminent and her striking exterior styling by the Russia designer Igor Lobanov is already turning heads. Built to the Passenger Yacht Code, Burgess provided technical consultancy and project management throughout the entire build process. Jubilee boasts a grand interior by Sam Sorgiovanni and is also offered for sale by Burgess as exclusive Worldwide Central Agents. Next month heralds the delivery of Hasna from Feadship, Royal Van Lent with exterior and interior design by RWD. Built for a long term Burgess client who was intimately involved with the project, Burgess New Construction was contracted as the owner’s representative, overseeing all specification and contractual work, supervising the technical construction throughout the installation, testing and commissioning, and negotiating modifications raised by the design development through the project. 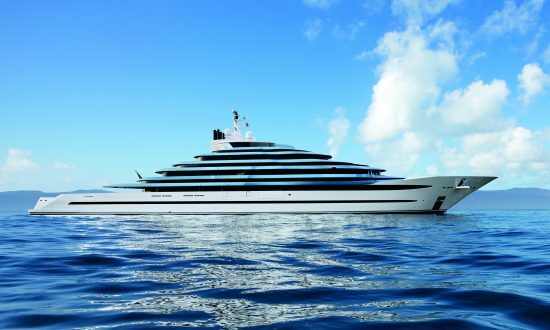 Conceived as a family yacht for global cruising, Hasna’s stand-out features include an eight metre green slate tiled infinity swimming pool on the main deck aft, an extensive gym and cardio room in the full beam beach club with opening terraces to port and starboard, a cinema, and crew quarters and facilities in excess of MLC. Looking forward, four projects are currently under construction in Europe and due for delivery in 2018. Two of these are over 100 metres and the other two inhabit the 75 to 95 metre size range. 2019 will see another vessel in excess of 100 metres delivered as well as a 55+ metre. Several projects between 50 and 120 metres are also under development. It is a testament to the team’s experience in commercial, naval and passenger ship building combined with their project management skills that many of the superyachts in their new build portfolio are truly ground breaking in terms of design, style, technical specification and performance.